Zoos Can Save a lot of Money Breeding their own Feeder Insects…. or You Could Sell Feeder Insects to Zoos for Profit! Zoos and Wildlife Parks require large amounts of fresh feeder insects on a regular basis. They are eager to find a local supplier of feeder insects as it saves on freight and the insects are much healthier. 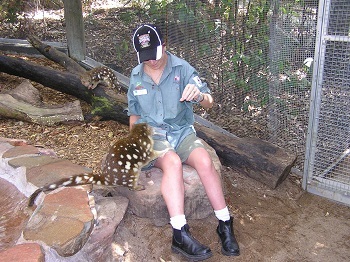 This is particularly true for wildlife parks located in remote regional areas. Many of them struggle to get insects delivered to them and are paying just as much in freight as they are for the insects. Many regional parks rely on collecting clients from nearby towns and driving them to their zoo via a shuttle service. We find that these zoos are willing to collect their insects on their way through to picking up their patrons from larger towns. As they don’t need to pay freight often these zoos can purchase twice the insects they would normally buy. So, don’t overlook the smaller regional wildlife parks, these could be some of your best clients. 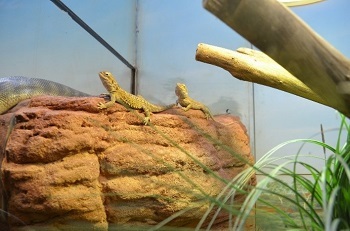 Some zoos breed mealworms and cockroaches themselves as they are relatively low maintenance and less likely to die. For these Zoos, you are likely to sell more crickets but less cockroaches and mealworms. Other Zoos don’t have the time or staff to breed insects and will therefore need all three species. 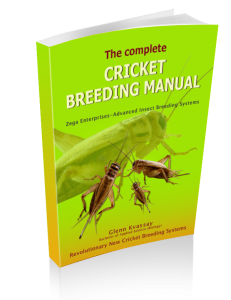 Crickets, were difficult to breed consistently without the right information and systems. Most colonies were devastated from pests or inadequate maintenance. Fortunately, we have spent 13 years streamlining cricket breeding which can now be done with far less time and effort. This greatly improves consistency and breeding all three species is now a viable option to Zoos or people wanting to sell to Zoos. Live foods such as insects have a limited shelf life and are best sold within a few weeks of reaching their optimal size. For instance, adult crickets need to be sold within weeks of reaching maturity. Occasionally you will get excess stock which needs to be moved on. Instead of letting them go to waste, we give them to potential new client at half price on the proviso they use them straight away. This is a great marketing opportunity to tell them about your business, and many of them appreciate the discount and become new clients. For more than a decade we have developed the world’s most comprehensive training resources to breed insects for profit, which includes: Books, Videos, Skype Information Sessions and One-on-One Consultations. No matter how small or large your operations we have methods and information which can get you on the right track. Our systems have been used around the world to not only set up new businesses but also to improve the efficiency of existing insect farms. Click here to learn what resources are around to help you Breed Insects for Zoos.